Escapist in a windshield pitch. What is it? Ultralight backpacking tarp. Size: Medium - 6 ft. 6 in. x 8 ft. 6 in. Large - 10 x 10 ft. 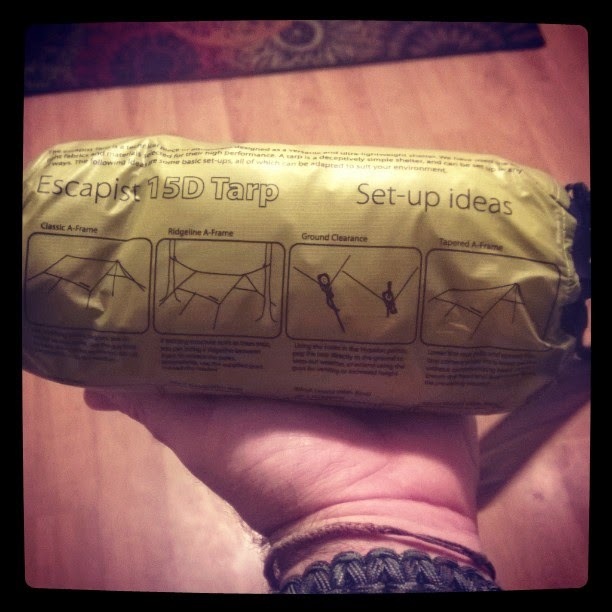 The Sea to Summit Escapist is my first true tarp. I've owned a couple tarp tents before: The Golite Shangri La and the Six Moon Designs Gatewood Cape, and I like the Escapist better than both of them. The medium Escapist is the perfect shelter for the solo backpacker who likes to go extremely light. I love it for the desert because in the desert you typically don't need shelter, and there aren't many mosquitoes. In that case I carry the Escapist more as a backup, or more commonly, a windbreak. In fact, every time I've ever pitched the Escapist, I've done so primarily as a windbreak. That's why this thing is so cool. It is very versatile. There are probably dozens of ways to pitch a rectangular tarp, and the Escapists packaging comes with a few ideas. The Escapist has eight reinforced tie-out points that can all take a trekking pole. Each of these points come with cord adjusters and reflective guyline, so it's ready to go brand new. All these tie-out points really give the Escapist its versatility. What's impressed me the most about the Escapist is its durability. On a few separate occasion camped in the desert I've experienced extremely high winds. Winds that were blowing so hard I had to stack boulders over my stakes to keep them in the ground. This tarp is strong and well made and despite its lightweight, has stood up great over the last 6 months. It's got no holes, tares or any other problems. One of the big drawbacks of pitching with trekking poles is the loss of head room due to the fact that your tied off into the ground. I found this a problem with the classic windshield pitch and the A-frame pitch. On those occasions high winds forced me to tighten the guylines, which resulted in a lowering of one section of the tarp. Usually the section in between the trekking poles. One way to offset this is by placing your poles in adjoining points. No matter how much you tighten the pitch, you'll never lose headroom. Bottom: In the classic windshield pitch you can see that I lost headroom after tightening the center guyline. If the center guyline were anchored to a tree it wouldn't have been a problem. There is a learning curve with the Escapist. Don't expect to purchase this shelter and set it up perfectly the first time (unless you are experienced with this shelter type). It's nothing like a freestanding tent. It takes practice. To me, the versatility and absurd weight savings are well worth spending a little extra time in camp with set-up. Using the Escapist I found that I was more particular than ever about set-up location and site preparation. The Sea to Summit Escapist is great for anyone stepping into the world of ultralight backpacking. Its versatile, strong, light and packs extremely small. Set-up takes practice, but learning the different pitches is half the fun. Note: It rarely rains in the desert, and I never got a chance to use this tarp in rain.